Just a brief update as I attempt to record significant events/thoughts on my journey to become a data scientist. 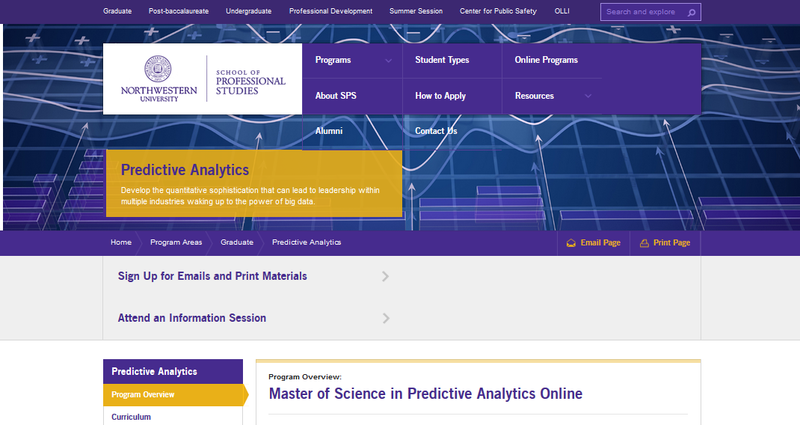 I just received my official confirmation that I have been accepted into Northwestern University’s Master of Science in Predictive Analytics (MSPA) program. I am due to start in the fall. Here is the link if you are unfamiliar with the program. I selected this program for many reasons. First, it is oriented towards what I really want to do – predictive analytics. This should give me a solid foundational background upon which I can build the specific skills and specialization I need to develop smarter bedside monitoring systems and help predict patient outcomes. Second, this is an online curriculum. At this point in my life I am not easily able to move or change jobs. I am a practicing Emergency Physician. I am a Chief Medical Information Officer for my health system. And I am the Medical Director for our flight service. I really enjoy all of these pursuits, and am not willing to give this up to move and go back to school full time. Nor could I with my family obligations. So the online option works best for me. Third, Northwestern has a great reputation in this field. I did my due diligence and researched the program, and the feedback I received was overwhelmingly positive. As an aside, I did most of my undergraduate degree at Northwestern in the 1980’s (I did not graduate, but would love to finally have a degree from them, so this will hopefully allow me to do this!). So the easy part is over. I have been accepted. Now I will have to do the hard work of learning all of the new material and keep up with the coursework, while still performing my regular day jobs. Previous postGreetings from Billings Montana! Good luck with your program ! Northwestern is one of the finest institutions out there.